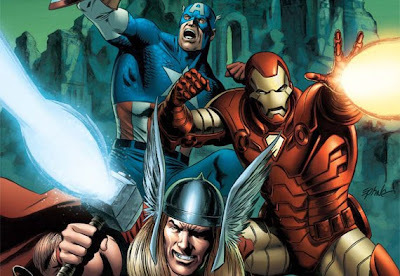 Forget the cast of F.R.I.E.N.D.S, The Spice Girls, or AC/DC, the reunion at the top of every Marvel Fanboy’s list is that of Captain America, Thor, and Iron Man in the pages of The Avengers. The return of the trio, has been one of the main selling factors in the promotion of current event mini-series SEIGE, the upcoming Avengers #1, and just announced this week; a new mini-series dedicated to re-establishing the group as B.F.F’s, Avengers Prime. Add to that, films of all three heroes lead into the upcoming movie of Earths Mightiest Heroes, and it seems the bro-mance is set to become the new foundation of The Avengers. Don’t get me wrong – I’m for anything that draws attention to this corner of the Marvel U. These characters have spent too long playing second fiddle to the x-milking cows of the House of Ideas, and it’s great to see a bit of a paradigm shift in their direction. 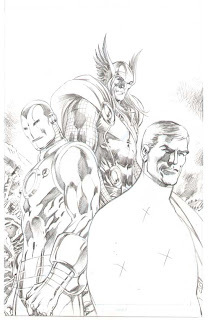 What I am a little apprehensive over, is that the mass-marketing of Marvel’s ‘Avenging Trinity’ as the core of the team, that may put the Avengers in the same predicament as DC’s Justice League. With the JLA, fans are forever split between those who believe the teams nothing without the trinity of Superman, Batman and Wonder Woman (or to another extent the ‘Big 7’), and fans who just want a decent writer with an interesting mix of faces. 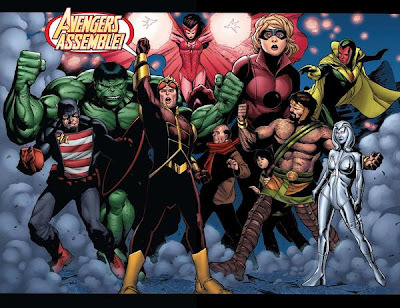 Plus, while the teams values are spearheaded by those of Captain America, the new focus seams to overshadow the efforts of Hawkeye and The Black Knight, who held the fort on their respective coasts for years, and the oddball family at the core of many Avenger adventures; Henry Pym, Wasp (both other long serving founders), Wonder Man, Ultron, Vision, Jocasta and to a wider extent The Scarlet Witch. Sure all the egg counting before the hatching takes place could end up in vain, as there will probably still be at least one title, like Mighty Avengers, that still has that ‘classic’ feel to it. Just as a fan who’s collected Earths Mightiest, on both coasts, through the 80’s and 90’s until Heroes Reborn, then jumped back on when Kurt and George took over, you always get a little nervous when a little ‘new coke’ flavour starts heading your way. *Sigh* – retaining old fans, while attracting the new – remind me why anyone wants to be a comicbook publisher again?